What Are Starspots Like on Sun-like Stars? Are All Sun-like Stars the Same? We refer to stars with approximately the same spectral type as the Sun as “Sun-like,” but how similar are they really? One way to gauge this is by studying the stars’ magnetic activity, like their starspots (relatively cool areas of the stellar photosphere where magnetic flux bubbles out of the surface) or stellar flares (sudden releases of energy in the form of lots and lots of photons — all the way from X-ray to radio). Some Sun-like stars have been observed to unleash so-called superflares, which are thought to arise from processes similar to garden-variety solar flares but have 10,000 times the energy. Has the Sun ever set loose a superflare? Could it do so in the future? It’s not clear yet, but it’s an important question to ask, since a superflare could seriously disrupt the satellite networks we’ve come to rely on. By studying flares on other Sun-like stars, we can get a better sense of the similarities and differences between the Sun and the Sun-like stars scattered across the universe. 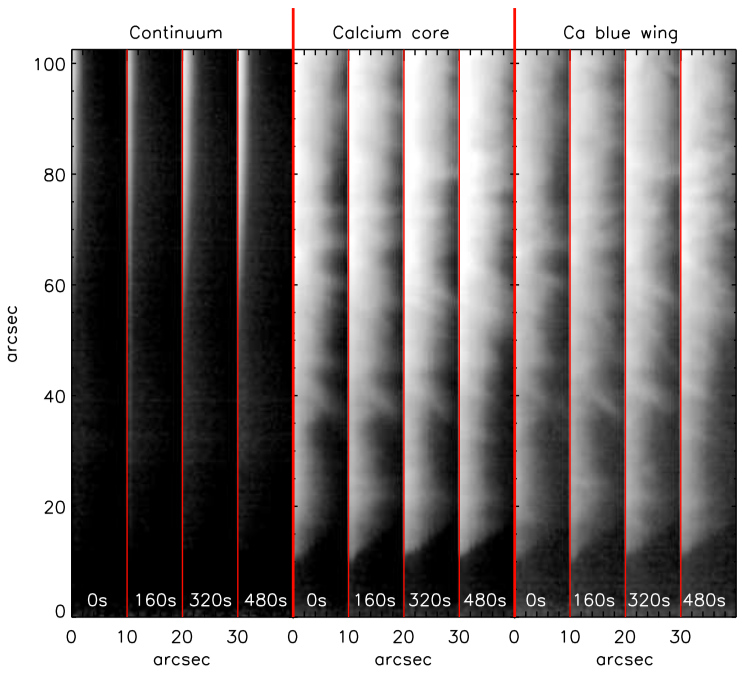 Superflares can also tell us something about how magnetic fields are generated and configured on other stars; superflares (and solar flares) seem to be linked to starspots (see Figure 1), which are a visible manifestation of a star’s coiled and twisted magnetic field. By studying the starspots that superflares are linked to, we can gain a better understanding of the magnetic dynamos of other stars. However, our telescopes don’t have the resolution necessary to directly image starspots on other stars. How do we study activity on distant stars? Kepler: Not Just for Planets! The authors of today’s paper used Kepler space telescope (may it orbit in peace!) 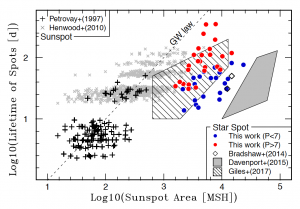 light curves for over 5,000 stars to study starspots on Sun-like stars. 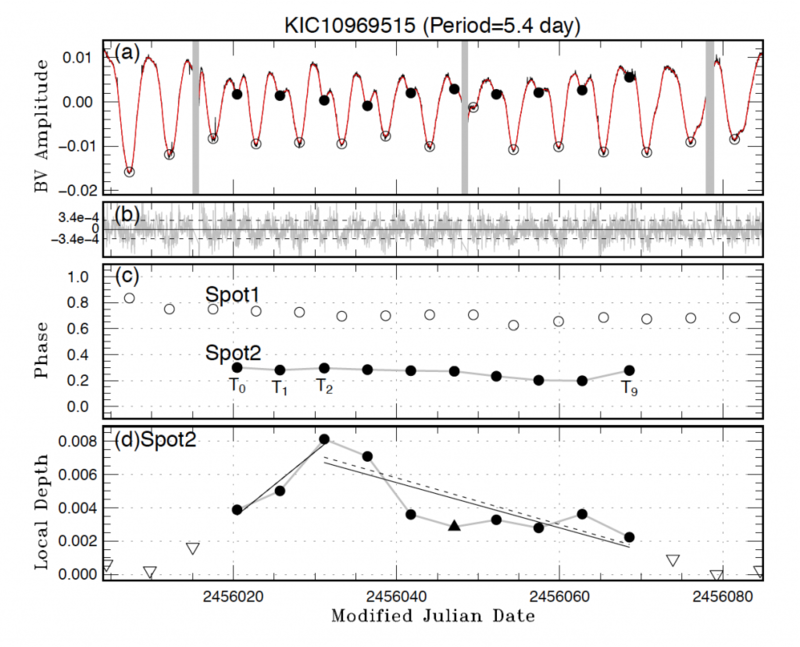 In order to identify starspots, the authors searched for repeated dips in the Kepler light curves — signaling the spots transiting the visible face of the stars as they rotate. In total, they were able to track 56 sunspots as they formed and faded (see Figure 2). Figure 2. 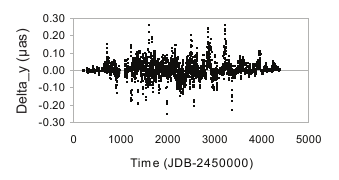 Example Kepler light curve (a), along with the residual between the data (black) and the fit (red) in panel (b), the phase of the starspots (c), and the depth of the minima as a function of time (d) for a star from this study. Figure 1 from the paper. For each of the starspots, the authors calculated the area (from the depth of the brightness dip), the lifetime (from how long they were able to track the presence of the brightness dips), and the rate at which it emerged and decayed (from how the starspot area changed over time). The authors found that starspots tended to emerge and decay at rates consistent with what we expect from studying spots on our own Sun, which hints that starspots on stars near and far are governed by the same processes. They also found that the lifetimes of the individual spots (10-350 days) tended to be shorter than expected given their area (0.1-2.3% of the stellar surface), but cautioned that the starspot lifetimes could be underestimated because of the difficulty of detecting the spots just as they are emerging and fading. Figure 3 shows a comparison of the areas and lifetimes of sunspots and starspots. Figure 3. 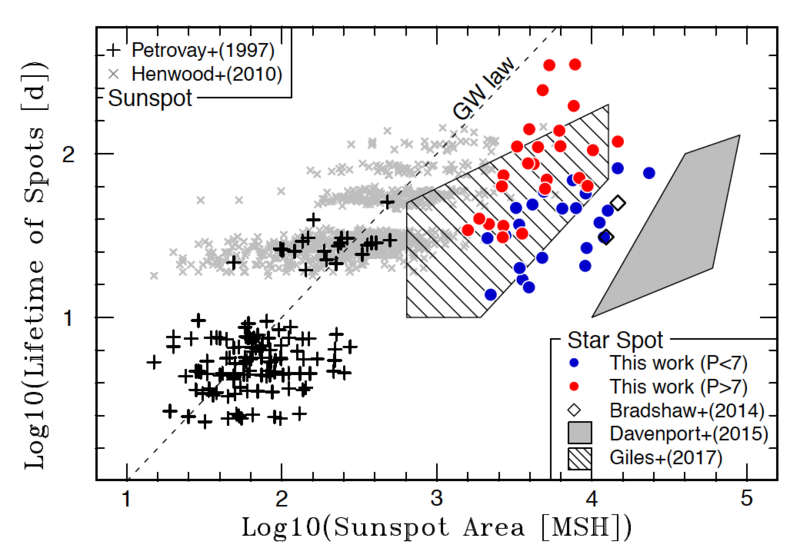 Starspot lifetime versus area for both Sun-like stars (filled circles) and the Sun (black and grey crosses). 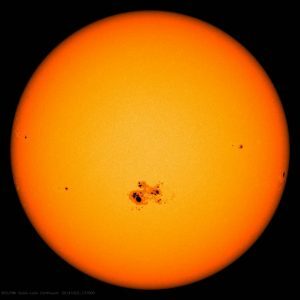 Sunspots tend to follow the Gnevyshev-Waldmeier (GW) law, while starspots on other stars tended to have shorter lifetimes for a given area. Figure 7 from the paper. The lifetimes of the largest starspots — those with areas of about 10,000 millionths of the solar hemisphere (about 30 billion square kilometers) — tended to be about a year. The rate of superflare occurrence also seems to be about once a year, suggesting that the presence of a large starspot is a strong indicator that a superflare will be released. We still have a long way to go toward understanding magnetic activity, starspots, and superflares on Sun-like stars, but today’s paper gets us one step closer. Hopefully, the wealth of Kepler data will continue to provide discoveries like this for many years to come! Featured Image: An extreme closeup of a sunspot. Image courtesy of NASA and the Goddard Space Flight Center. Image was produced by the Swedish Solar Telescope. Credit: SST/Royal Swedish Academy of Sciences.